Tata Motors will be launching its Harrier SUV in January 2019 and it is based on the OMEGA (Optimal Modular Efficient Global Advanced) platform derived from Land Rover’s D8. The premium five-seater will compete against the likes of Hyundai Creta and Jeep Compass, and it is one of the key launches from the brand next year. The homegrown manufacturer has already starting rolling out the Harrier from its production facility in Pune and it has the same wheelbase as Land Rover Discovery Sport at around 2.74 metres. The Harrier debuts the Impact Design 2.0 philosophy, which is an evolved version of the existing styling present in current crop of vehicles such as Tiago, Tigor, Nexon and Hexa. The Harrier takes plenty of design influence from the H5X concept that caught spectators’ attention in aplenty at the 2018 Auto Expo in February. The exterior has unique design elements like unusually positioned headlamps, wide air intake, aggressive front bumper, slim LED Daytime Running Lights, stylish rear end, sweeping bonnet structure and raked windshield giving a butch appearance. The monocoque SUV has an equally attractive interior with the floating 8.8-inch touchscreen infotainment system enabling Apple CarPlay, Android Auto, Bluetooth and MirrorLink sitting in the middle. The cabin gets a dual-tone brown and grey colour scheme while cooled glove box with under arm storage space, different driving modes operated via rotary dial, switchable traction control, hill hold function, hill start assist, etc are other highlighting features. 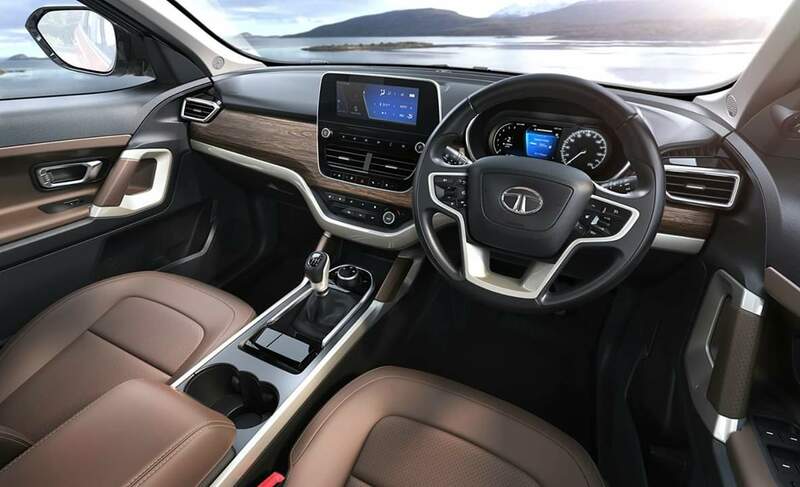 The use of soft-touch and premium materials on the inside is appreciable and a large silver band runs across the width of the neatly finished dashboard. The Harrier is powered by a 2.0-litre four-cylinder diesel engine dubbed Kryotec and is good enough to produce a maximum power output of 140 hp. Tata is expected to only offer a six-speed manual transmission at the time of the launch. The Hyundai-sourced six-speed torque converter automatic could join the lineup at a later time. The Harrier carries huge expectations on its shoulders as it will be key for the brand’s sales aspiration in the premium segment. It is expected to be priced in the region of around Rs. 16 lakh to Rs. 22 lakh with several segment first features.